Somehow I have managed to miss out our skylight update..
Well, when we got the new ones put in, I thought I was being really clever, because we wanted exact replicas of the ones we had (which were rotting), and we have copies of the original working drawings for the house...So, me being the logical and straight forward thinking person that I am, I figured if we gave the builder a copy of the working drawings, and said that we just wanted them exactly the same, then he would be able to get us some new ones, exactly the same. 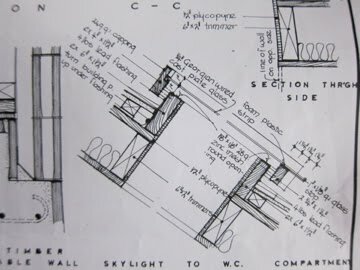 And because they're working drawings they have all the dimensions, materials and information anyone would need to reproduce new skylights - right? Wrong. I already wrote about how the glass that goes into them is different, but we dealt with that (fortunately Matt preferred the clear glass). The next problem with them came up after they were installed. The wind blew. And our toilets were filled with leaves and dirt. Lots of leaves and dirt. You would go the toilet and if the wind was blowing you would have a shower of little green leaves gently falling on your head and shoulders..almost kind of romantic. Except it was in the toilet. And leaves are not meant to come into toilets. What went wrong? Well, our skylights have a vent which is really just a gap between two of the wooden parts, and if you look at the working drawings, that gap is supposed to be bridged with some mesh. But it wasn't. They just left a big old gap. Nice. So as well as re-doing the bathroom, we're getting the skylights removed and mesh installed. Did I mention how awesome that is (insert sarcastic tone here)? The Bathroom - Take Two.